You can choose to highlight nothing, one of the series and two of the series: no more than two. The formula you need to convert raw data to ranked data is, for example: =RANK(K26,K$26:K$29,0) … see the spreadsheet file, link below, to see exactly how I used it. 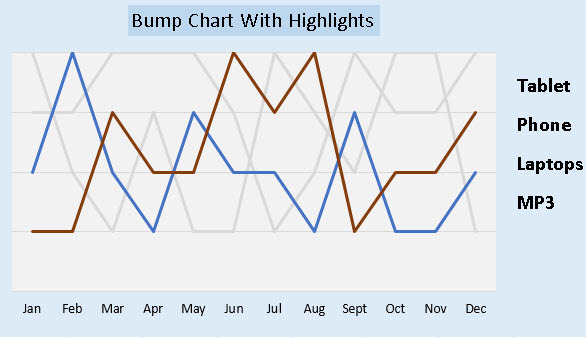 Notice how I used NA() in the formula for each month, the second VLOOKUP() formula. 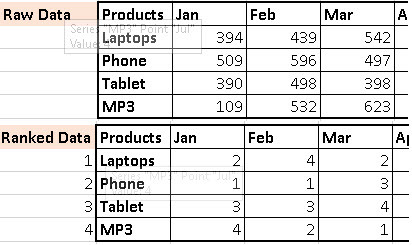 Filling the second of the formulas right to fill all months’ columns completes the table for each product. In the combo box I allowed for there to be no selection: so, no highlights, one highlight or two highlights. Again see my file to see how that works. All basic data series are coloured light grey and they are always on the chart. The highlights overlay the basic series as appropriate and are coloured: choose your own colours, of course. That’s it! 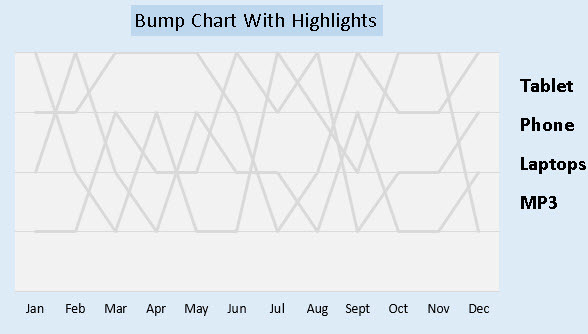 Bump Charts illustrate rank orders over time in a really meaningful way and now you’ve heard of them too!